Built in 1912 by Mr. Niles Gillenwaters in Sacramento, California. He built only one, and it never went into production. Lovingly restored by Mr.David Sarlyn of Berkeley, California, it is part of the Daniel Zelinsky Collection at the Musee Mecanique in San Francisco. Later, we had dinner again and he asked me who got the best deal in the trade. I said, "I don't know, George, you tell me." He said, "Ed, I got the best deal. I got a Franklin that's running and you got a motorcycle that isn't, and needs repair." I told him, "That's funny, George. 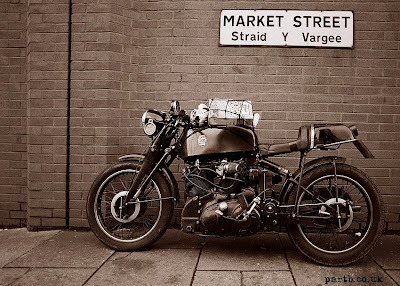 I thought I got the best of the deal because I got the only steam motorcycle, perhaps, in the whole world." He called me up a few weeks later and asked if I wanted to trade back again. 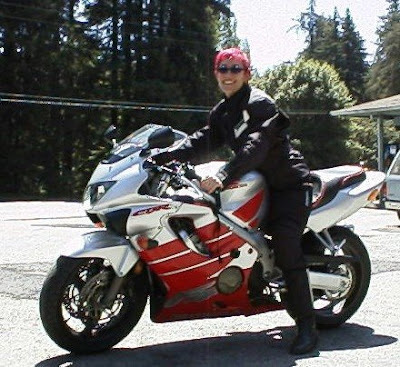 That's when I knew I had a good deal because recently, I received an unsolicited offer of $250,000 for the motorcycle"
"This machine is a heavy duty bike used as a tactor or as a movable engine (then the rear wheel is removed and a machine is pluged in place of it). 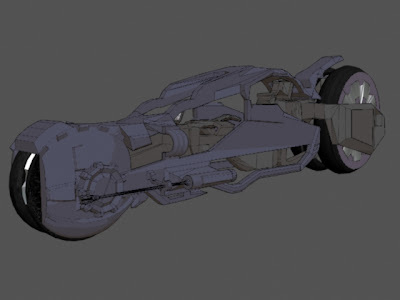 This machine belongs to the beginning of the Alterra colonisation, when power units where rare and only used as community devices. It works with pressurized hydrocarbures (sic), the power unit is a turbo-machine and the transmission is first a "torque convertor" and then a strong shaft to the rear wheel." 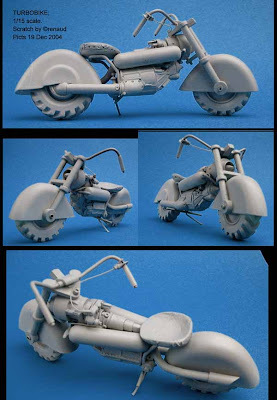 The motorcycle in cinema-Resident Evil: Apocalypse. 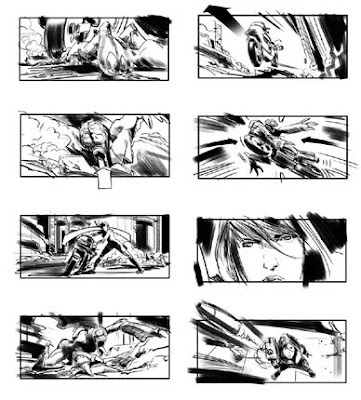 "Resident Evil: Apocalypse is a 2004 science fiction action horror film. It is the second installment in the series of film adaptations based on the Capcom survival horror series Resident Evil. Borrowing elements from Resident Evil 2, 3: Nemesis, and Code: Veronica, the film follows the heroine Alice, who has escaped the underground Umbrella facility, and must band with other survivors including Jill Valentine and escape Raccoon City, before it's too late. The film was directed by Alexander Witt and produced by Paul W. S. Anderson." 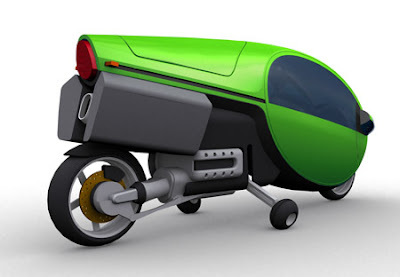 Falcorustyco: from high concept to cheap pocket bike. 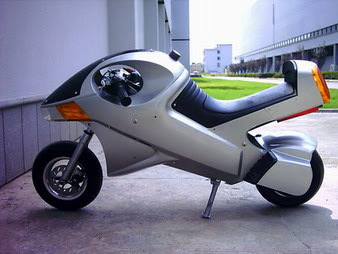 Suzuki's concept bike Falcorustyco was not missed by many of the visitors of the 1.2 million motorcycle enthusiasts that visited the Tokyo Motor Show in November 1985. 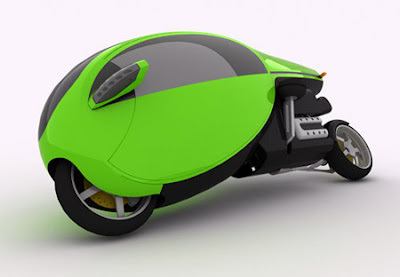 The concept bike (a one of a kind experimental model, not for sale) surely looked different, and had some interesting technical solutions as well. 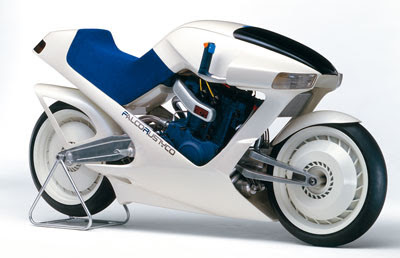 Although the Falcorustyco was the designers high-tech dream bike, Suzuki had intentions to make a concept bike that was not impossible to put into serial production within a few years. 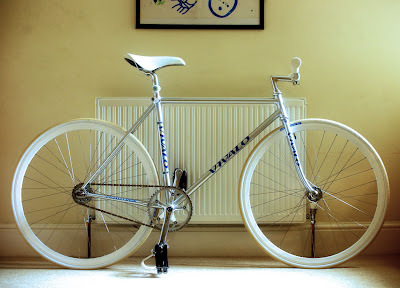 The Falcorustyco had no frame like a normal bike. 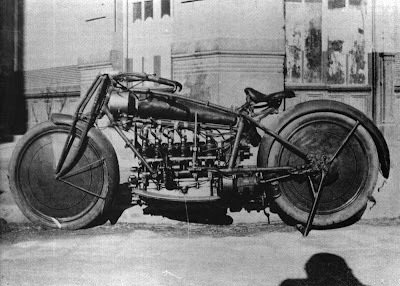 The front and the rear swing arms were attached to the 500cc square four engine. Not the RG500 Gamma engine - According to Suzuki it was a new water-cooled four-stroke power plant with 16 valves and three cam shafts. The final drive was not chain, belt or shaft, like all the other bikes. No, Suzuki chose to use hydraulic pumps that transported the movement energy to both wheels. No gear box was needed. Hydraulic hub-steer. The brakes were electromagnet type and the suspension was maneuvered electrically. 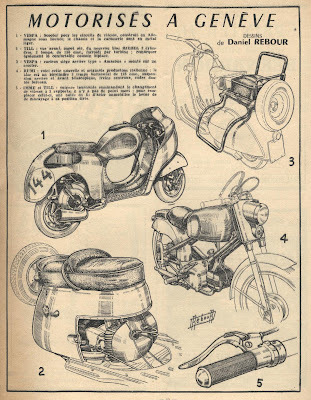 The motorcycles journalists were convinced that the Falcorustyco (a Latin word for gyrfalcon) would be mass produced in the near future. They were partly right. 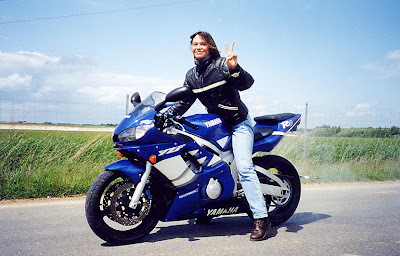 A model called gyrfalcon was produced by Suzuki in 1999, the GSX1300R Hayabusa (a Japanese word for gyrfalcon), but it was a conventional motorcycle with chain drive, an inline-four with two cam shafts and conventional brakes and steering." 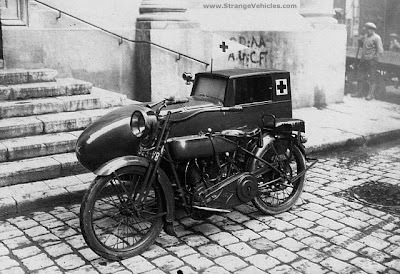 The machine may have been built in 1921 by the National Spanish Motorcycle Factory in Baddalone"
The Post-Apocalyptic Young Gentleman’s Motor Club. "Congratulations! 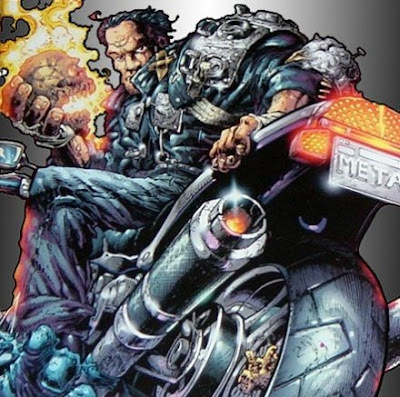 If you are reading this then you have just been accepted into the Post-Apocalyptic Young Gentleman's Motor Club, or PAYGMC, Australian Chapter #235. You should be very proud of yourself at this moment, for few make it past the crucifixion and tickle party that is included in the test of trials. 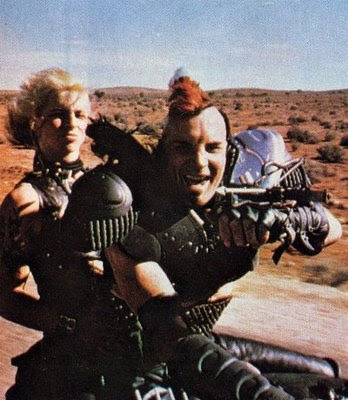 You are now part of an elite road warrior club that takes pride in their handiwork of mayhem. You are here because like the rest of us, you have a special attitude that will take you far in the post-nuclear holocaust, and you want a life better for you and yours. This manual will be your best friend for your first couple of months riding with us. It will teach you all you need to know, which is a good thing since most of the members can only grunt or make lewd gestures to communicate. Memorize this manual front to back, and don’t lose it! If you misplace it, then Lord Humungus will bury you in the sand up to your neck and read his 500 page manifesto to you through his PA system while rubbing mayonnaise on his abs. Welcome to the club." "John Morales' Vincent Black Shadow sporting Ducati NCR ali racing tank, & Ducati 900SS seat hump, all sprayed rattle-can matt black. photographed on the Isle of Man 1993. 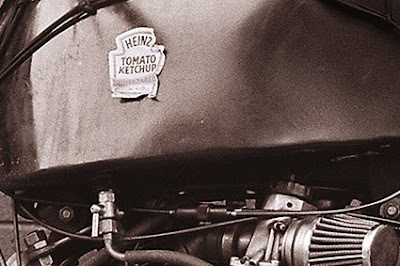 There were a lot of shiny Vinnies riding around the island, but most were not very impressed with its get-up & especially not the Heinz Ketchup sticker on the tank." "Ever heard of Bessie B. Stringfield? Most likely not. 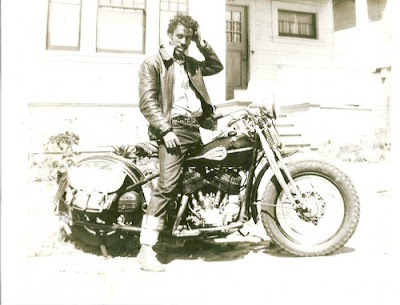 Stringfield was an African American motorcycle enthusiast who flouted Jim Crow segregation and sexism when she hopped on her bike in the 1930s and took a tour of all 48 contiguous states of the Union. Her story is a solid metaphor for black bike culture: a story that is equal parts fierce individualism and a quest for a life without boundaries but which also points to a legacy that has largely existed in history's shadows. 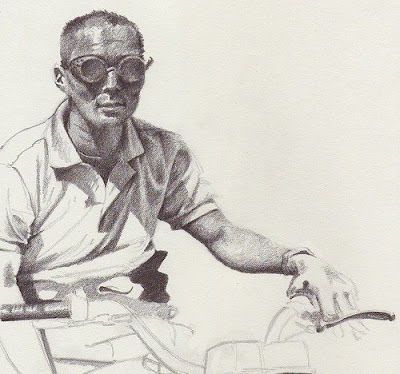 Just after World War II, black Californians began carving out their unique take on bike culture through design, riding styles, racing and riding tricks. 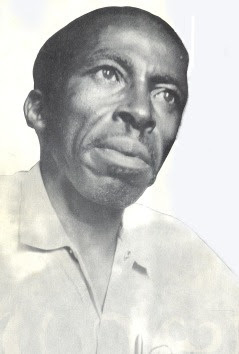 The exhibition spotlights innovators such as Ben Hardy, (below) who designed the Captain America and the Billy Bike featured in "Easy Rider," and explores the history of all-black clubs such as Buffalo Soldiers, LA Defiant Ones, East Bay Dragons, the Magnificent Seven and Rare Breed. Alongside historic and contemporary photos, restored and custom bikes also will be on view -- all of it puzzle pieces that help to complete the picture of California's idiosyncratic history of the road. The show runs through April 12"
The Art of Javier Tles. 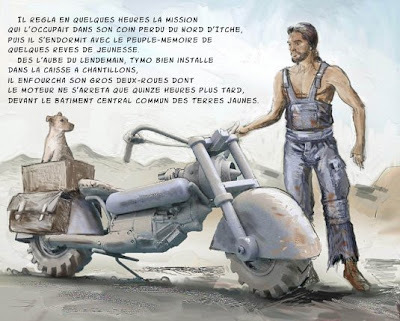 "Robert M. Pirsig’s “Zen and the Art of Motorcycle Maintenance” (1974) was the rare quest narrative in which two American males headed west in search of enlightenment and didn’t score a single chick along the way. 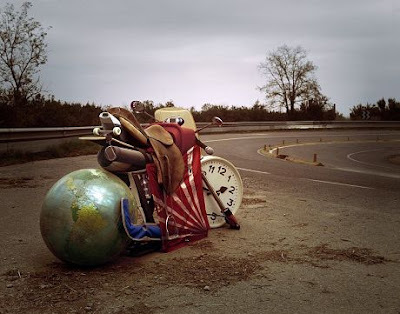 Chaste and pedagogic, the book has sold five million copies and inspired way-seeking “Pirsig’s pilgrims” to retrace his journey, plotting its GPS coordinates and debating his ideas on the Internet. Devotees compiled a readers’ guide and organized an academic conference dedicated to Pirsig’s unifying idea, the Metaphysics of Quality. 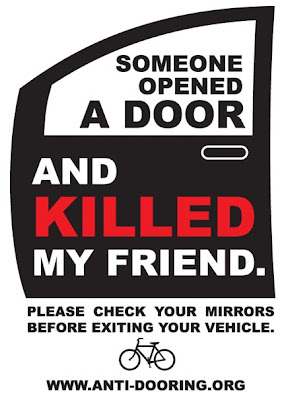 Friends, haven’t we all been there? Haven’t we all traveled to the mystic mountaintop or to Elvis’s burial place, hoping for contact catharsis, only to find the same perceptive blockages we carried up in the first place: wow, cool mountain, now what? Or, as Richardson expounds in midjourney, “A big part of the message of ‘Zen and the Art of Motorcycle Maintenance’ can be boiled down to a truism: if a job’s worth doing, it’s worth doing well.” This level of insight never lets Richardson down, but it never quite lifts him up, either. Elsewhere in “Zen and Now,” he finds “a reminder of one of the greatest lessons of all: live as if you’ll live forever, but live each day as if it were your last.” And, when he misses his family, he finally discovers that “we’re re lated to each other in ways we never fully understand, maybe hardly understand at all, but my family is pulling at me now as, at 42, I come to realize the meaning of my life. . . . People who care and people who care enough for me to give me a home — they are Quality.” Like Pirsig’s, his is a book of its time: the new seeker’s payoff is therapeutic, and father hood is life’s wondrous gift. 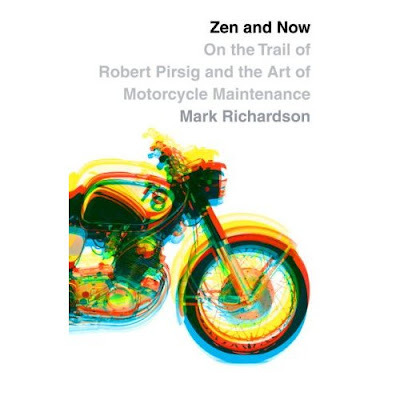 Richardson interweaves a broad outline of Pirsig’s troubled and fascinating biography. Before his Zen journey, Pirsig was institutionalized and forcibly given electro shock therapy, and much of “Zen and the Art” is the narrator’s dance with his pre-shock self, whom he calls Phae drus. Pirsig later described his collapse, which included waving a gun at his wife, as either “catatonic schizophrenia” or “hard enlightenment,” depending on your perspective. He declined to make that call; his ex-wife, Nancy, chose the schizophrenia. His turbulence passed to his son Chris, his travel companion in “Zen and the Art,” who was also later institutionalized, and eventually stabbed to death outside a San Francisco Zen center in 1979 during a mugging. 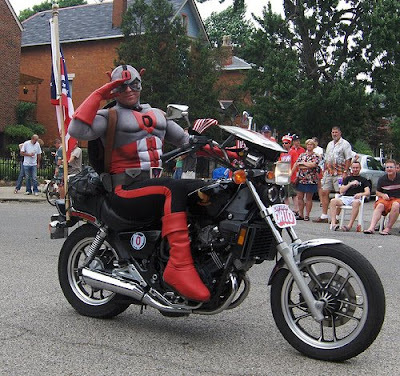 Richardson, on the other hand, is a motorcycle guy. He’s best describing the gear or the feel of the bike. “It’s almost like bull riding,” he writes of heading down a Montana road, “and just as I let out a ringing yee-hah, the road turns without warning … and an almighty pothole bottoms the suspension, almost throwing the bike into the fence alongside.” His tensions are automotive: Will he run out of gas? 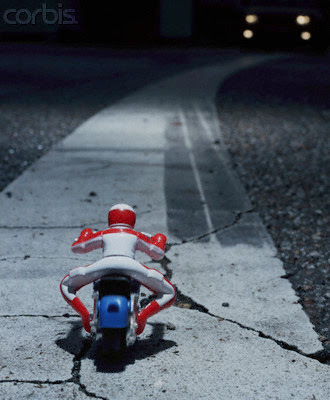 Will he be able to swerve to avoid oncoming traffic? It’s a nice travelogue that occasionally abandons Pirsig’s austere path. “That’s not for me,” Richardson writes. “I’ll take a snug Super 8 any day, or an attentive server at a decent steakhouse.” The journey through what Pirsig called “the high country of the mind” need not entail outdoor camping or bad coffee. This isn’t a biography, and Richardson doesn’t provide enough interviews to flesh out the testimony of Pirsig and a few people close to him. 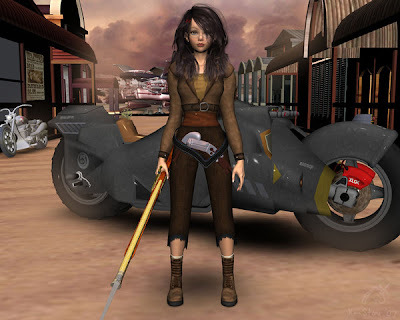 For example, part of both “Zen and the Art” and “Zen and Now” concerns Pirsig’s battles with the philosophy department at the University of Chicago, which Pirsig describes as high drama, featuring a rebel genius against the tenured forces of darkness. 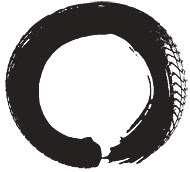 “Zen and Now” offers no second opinion. Richardson’s modesty, winning in small doses, distances him from his subject, who was all grand ambition. In the end, Richardson writes, “Robert Pirsig’s remarkable book changed my life in numerous ways.” I wish I could tell what they were." "After graduated from Architecture degree, Michelle Wibowo (a member of the British Sugarcraft Guild) pursued her passion in Cake Decorating and Sugarcraft by enrolling to BTEC Course in Baking Science in 2001. In 2002-2005, she developed her skills in cake decorating by gaining experiences in many cake shops in and around London. During this period more than 2000 cakes and sugar models she has produced, some of them are commissioned by famous celebrities and high-profiled individuals in the country. Her work on "Royal Wedding Cake" has made appearance in the national television. 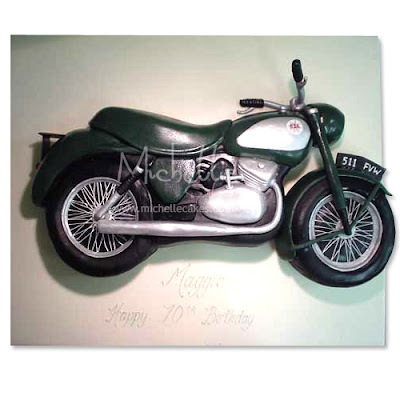 In 2005 she moved to Burgess Hill in West Sussex and started her own studio, specialised in Sugar Modeling and Custom Made Novelty Cakes, she also work freelance. Some of her work includes 1:66 scale of "Museum of Childhood" was commissioned by Victoria & Albert Museum." 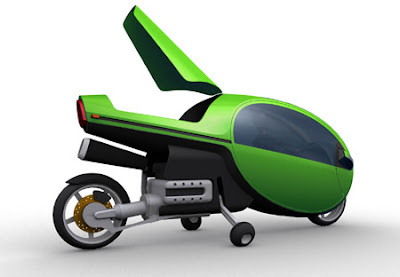 WetBike is a hydrofoil water motor cycle that is often described as cross between a motorcycle and a jet ski. 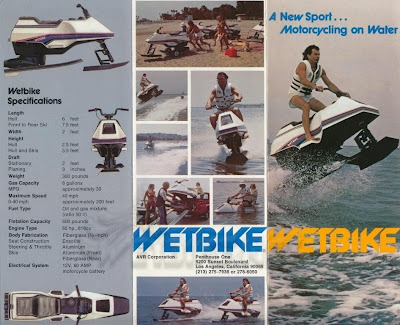 The original wetbike was introduced in 1978 by Spirit Marine, a subsidiary of Arctic Enterprises (now known as Arctic Cat). 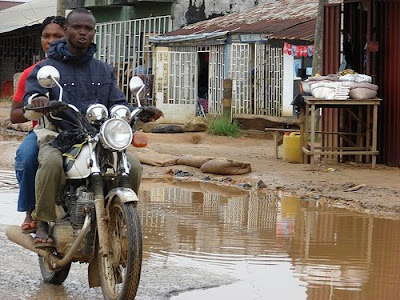 The Wetbike is challenging to ride, because like a motorcycle it does require a good deal of balance. 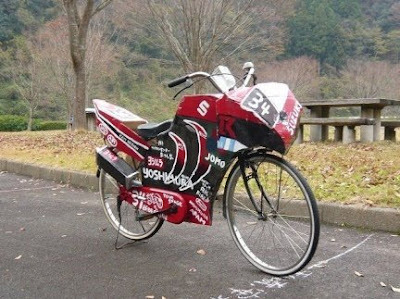 It was powered by a Suzuki 2 stroke engine, and a small Pump-jet. 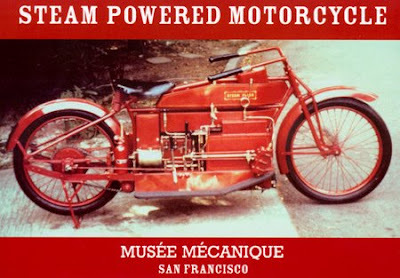 During the latter years of wetbikes (late 1980s) there were considerable advances such as 60hp Suzuki 800cc engines, and the Metton hulls, which were much lighter than previous models. 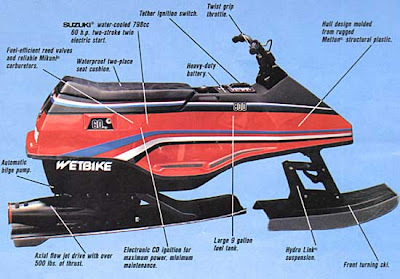 Eventually the Wetbike gave way to the new personal water craft (PWC) such as the Yamaha WaveRunner, mainly because they are much easier to ride. They were last produced in 1992. 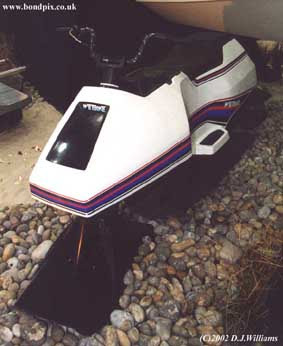 The first appearance of the Wetbike was in the 1977 James Bond film The Spy Who Loved Me. In one scene, right before the film's end, 007 is seen riding on a Wetbike (the actual Spirit Marine prototype) to villain Karl Stromberg's lair, the submergible fortress Atlantis. Bond refers to the Wetbike as a Q gadget." 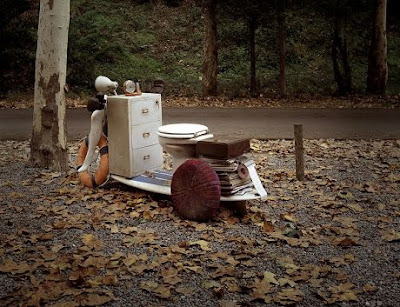 Via: If it's rusted, it's mine! It is said that Gunmetal is the best motorcycle rider and best shooter on the road and his bike is modified to attain greater speeds because it was able to ride alongside Ghost Rider's mystical bike without difficulty"
Zen Moment: Square Wheels and inverted Caternaries..
"inverted caternaries-a bike with square wheels can only be run on a special caternary road.. And as far as I know, there aren't many caternary highways." "Wonderful Days (Korean: 원더풀 데이즈) is a South Korean animated science fiction film, released in 2003. 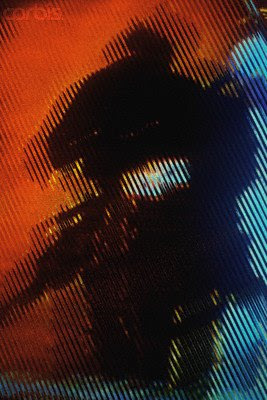 It features backdrops rendered using photo-realistic computer-generated imagery, comparable to those in the film Final Fantasy: The Spirits Within, along with the use of highly detailed models for some of the backdrops into which the cel animated characters were then animated. However, convincing CGI animation of humans (especially human movement) was not attempted." The perfect bike, The perfect picture. Gallery: Why we love Women. Sagan, Einstein, a Vespa and the speed of light. 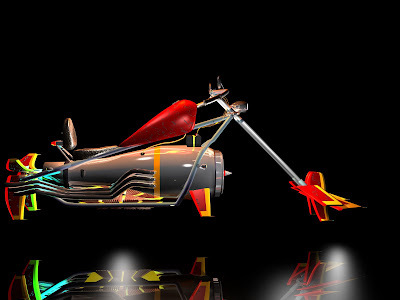 I am whatever Gotham needs me to be..
Cheng Feng Peng's Electric Rosta. Youtube: Saints Row 2 Trailer with Gary Busey. Blessing of the bikes: Grand Rapids. 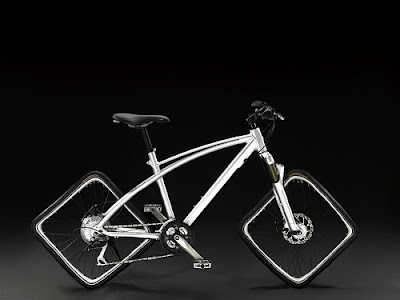 Nulla Minimalist and Stylish Bike Concept. flickr: Graham Hardy's Shuttleworth Snap. Youtube: Moto Polo in Rwanda. The best toy ever? G.I. Joe's R.A.M. 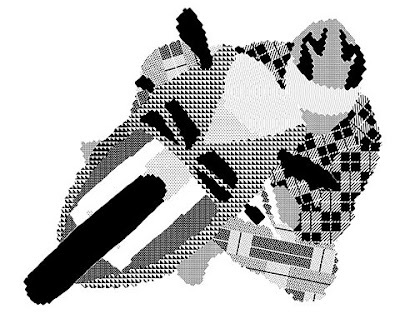 Kate Moross and Nike Dunk. 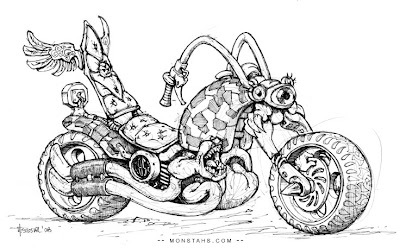 Marc Graells Ballve's scooter protection snail. 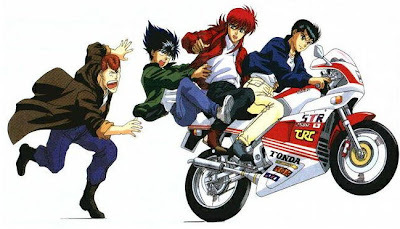 The motorcycle in cinema-Never Say Never Again. The Art of Nakisha Elsje VanderHoeven. The united colors of Vespa. 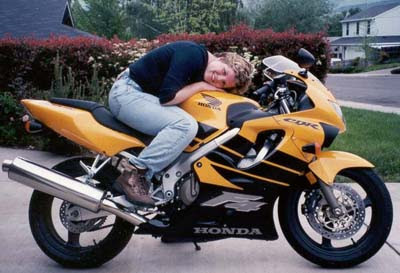 Our favorite bike: Bill Bragg's Yellow Peril. The young gentlemen's sporting club. 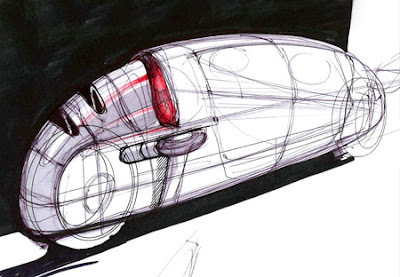 Igarashi Design's Turbo V-Twin Concept. Youtube: 1976 Moped Safety Film. 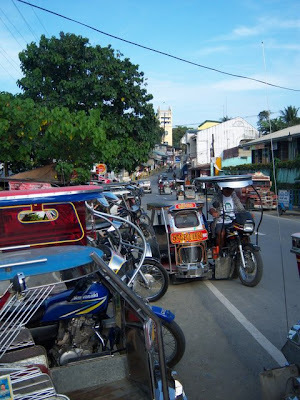 The obscure scooter club: The Walba and the Faka. 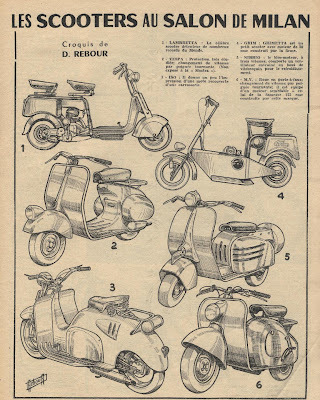 modernmechanix: The super cycle of 1936.